In order for cells to increase in number, either for growth or replacement of old cells, they go through the process of cell division – the cell cycle. Although the cycle is generally considered to consist of three major phases, there is a fourth phase to cell life. Cell cycles in various parts of the human body may last anywhere from 10 hours (bone marrow cells) to a lifetime (neurons). G0 is the “fourth” state, where the cell is not waiting to divide but is just doing its cellular thing. It may stay in this state indefinitely or eventually enter into the first phase of the cell cycle. 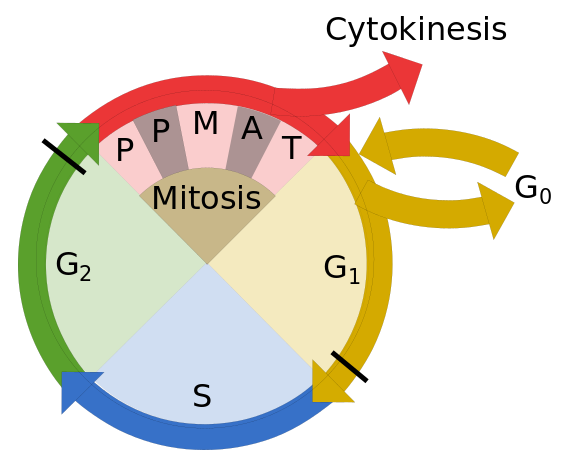 The cell cycle.. PPMAT = Prophase, Prometaphase, Metaphase, Anaphase and Telophase. Thick black lines are checkpoints. Author’s own work. The first major phase of the cell cycle is the so-called interphase, in which the cell fulfills its normal activities while preparing for cell division. The interphase is itself divided into three steps. During G1, or the first gap, the cell procures and stores proteins and energy for the task ahead. Near the end of G1, a checkpoint controls the cell’s readiness for the next phase. During the S (synthesis) phase, DNA replication takes place. Chromatin is condensed and each chromosome is duplicated into two copies, sister chromatids, which are attached at a point called the centromere. DNA replication takes place in much the same way as RNA transcription except that both strands are duplicated, entirely. The cell’s centrosome, the organizing center for microtubules, is also duplicated. The G2 (gap 2) phase is another moment for storing energy and making proteins. Also, the cytoskeleton is dismantled and some organelles are replicated. Near the end of the phase, another checkpoint is performed. During the first phase, prophase, the two centrosomes move towards opposite sides of the cell and microtubules form between them an array of links called the mitotic spindle. The chromosomes condense more and the nuclear envelope and the nucleoli break down. The main event of the prometaphase is the connection of the sister chromatids to the microtubules of the spindle by protein complexes called kinetochores . During the metaphase, the still condensing chromosomes are lined up in the equatorial plane of the cell, the metaphase plate. During the telophase, chromosomes decondense and the mitotic spindle breaks down in preparation for making new cytoskeletons. Portions of the endoplasmic reticulum are used to form new nuclear envelopes around the two separate chromosomes. The actual division of the cell into two takes place differently in plant and animal cells, since plant cells are surrounded by a stiff outer cell wall. In animal cells, a ring of actin filaments contracts around the center of the cell and pinches it in two. The contraction of the ring is probably due to actin and myosin acting as in muscles. In plant cells, the Golgi apparatus has stored up enzymes, proteins and glucose molecules during the interphase. During the telophase, these components move along microtubules to the metaphase plate. There, they grow and fuse and eventually form a new cell wall. At several points in the cell cycle, there are checkpoints at which the readiness of the cell to enter the next part of the cycle is controlled. The fresh copies are compared to the original strands and any divergent segments replaced. If the DNA is not intact, the whole process may be restarted or canceled altogether. The cell may actually be instructed to commit apoptosis, cell suicide. If ever, due to a mutation or bad gene copy, for instance, a checkpoint does not function properly, defective DNA could be passed on to daughter cells. This may lead to the unchecked replication of such cells and genes – cancer. Most animals and plants are diploid, meaning they have two sets of chromosomes, one copy from each parent. A cell containing only one copy of its chromosomes is called haploid. Cell growth and doubling take place through the cell cycle and mitosis, but reproduction of the organism depends on another cycle, meiosis. Mitosis grows new cells identical to the original. A diploid (or 2n) cell duplicate itself into two diploid (2n) cells. Meiosis, for reproduction, creates two haploid cells from one diplod cell. Then two haploid cells, one from each parent, join to make a child diploid cell. Meiosis I splits the cell’s DNA into two diploid pairs. Meiosis II splits the pairs into haploid sister chromatids. At the top of the figure (a) are shown two homologous chromosomes, meaning that they have the same chromosome number (between 1 and 23, in humans) and so correspond to the same genes. For clarity, they are labeled 1 and 2. Suppose that one (colored blue) comes from the father and the other (pink), from the mother. During the S part of interphase, duplicates of all chromosomes are made, called, as in mitosis. sister chromatids. The two blue chromosomes (1 and 3) are sisters and so are the two pink ones (2 and 4). All four are homologous. Sister chromatids are bound together at the centromere and will remain so bound until meiosis II. During prophase I (prophase of meiosis I), the two pairs, which are now visible under a microscope, are closely and precisely aligned, a pairing called synapsis (c). Being homologous, a gene on a pink chromosome is aligned with the corresponding gene on a blue one. The proximity of the two allows crossing over, or recombination, to take place (d), the reciprocal exchange of genetically equivalent sequences of DNA between two non-sister chromosomes, in this case numbers 1 and 2. Genes are exchanged between the chromosomes of the father and those of the mother. Since this is random, it is the first source of randomness in the resulting chromosome. The synapsis then loosens (e), but the pairs remain linked at the chiasmata (singular = chiasma), the loci where crossing over has taken place. The four chromosomes are said to constitute a tetrad. In general, a sister chromatid is no longer composed of genes from only one parent, but a mix of maternal and paternal genes. It can happen that a piece of one chromosome may break loose and join on to another. Such translocations have been observed in persons suffering from a specific kind of leukemia. At the end of prophase I, homologous, non-sister chromatids are held together at chiasmata; sister chromatids, at centromeres. During prometaphase I and metaphase I, microtubules of the spindle from the centrosomes, which are now on opposite side of the cell, attach via kinetochores to the centromeres of the chromosomes, i.e., to sister pairs. These connections are also random. Any pair of the 23 chromosomes may be pulled to one side and the other pair to the other side. This introduces a second source of randomness in the final product. In the case of human beings with 23 chromosomes, there are 223 – over eight million – possibilities. Next, during anaphase I, the spindle fibers pull the chromosomes to either side, with sisters breaking apart at the chiasmata, but remaining together, since the kinetochores are attached to the centromeres. In the cytokinesis phase, the two cells separate. In our case, chromosomes numbers 1 and 3 remain together, as well as 2 and 4. Each cell contains two chromosomes, but they are sisters, so the cell is considered to be haploid. In summary, at the end of meiosis I, parental genes have been exchanged on chromosomes by crossing over, and the distribution of parental gens is mixed by their random distribution to the two resultant cells, rather like cards which are shuffled and then dealt into two decks. During meiosis II, a kinetochore is formed on each sister chromatid. 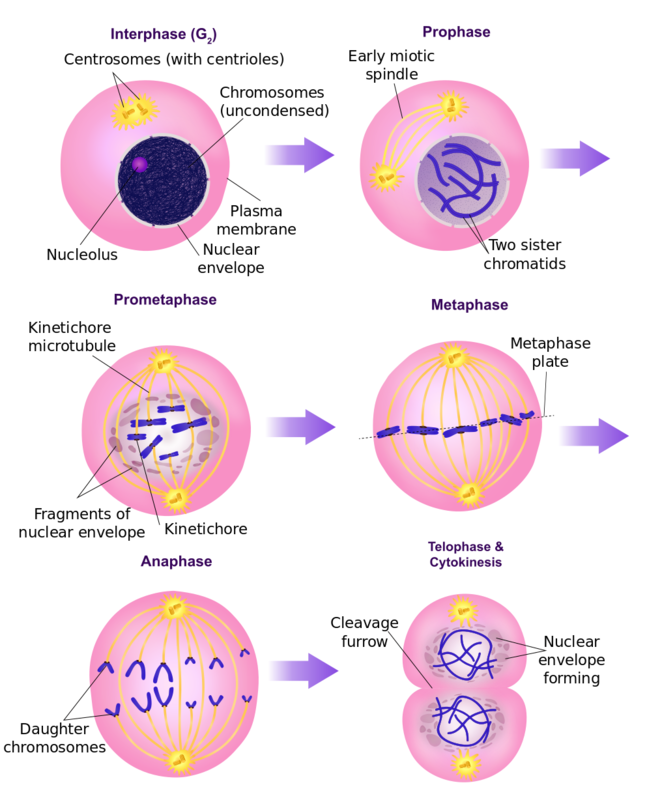 Phases similar to those of meiosis I take place until, in anaphase II, the chromatid pairs of each cell are pulled apart and nuclear envelopes form around each. 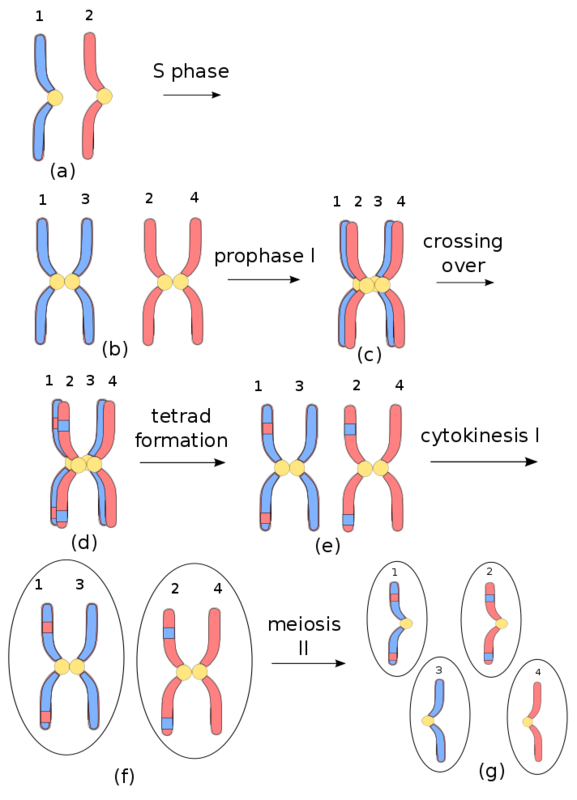 Cytokinesis finishes the separation, leaving only one chromosome in each cell, which is therefore haploid. Each one contains a random mix of maternal and paternal genes and forms a unique gamete (egg or sperm cell) of the species. One more time: Mitosis assures growth and cell replacement and serves reproduction in some simple organisms. Sexual reproduction, as in animals, requires meiosis. The process is shown in the following figure. Now let’s go see how meiosis and mitosis work in plant life cycles and take a look at the science of taxonomy.